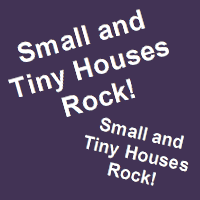 It has been quite some time since I posted a series of articles about small and tiny houses, which are the cornerstone of the tiny living lifestyle. I think I’ve thoroughly covered the advantages of a small house. However, I will add a few thoughts in this article about how this topic fits into personal development. This site covers a broad range of subjects that all lead to creating a lifestyle that is congruent with your authentic self and your personal development. I call this process “life styling.” Downsizing to a small or tiny house aligns with this philosophy because of how much you gain personally by designing, building, and living in one, over being burden by a big house. Many people, unfortunately, have bought into the “need” for a big house. I’ve learned to ignore most advertising messages — many of which have become social norms — because much of what they are pushing is often not in our best interest. Instead, it is in theirs in the form of profits! I saw it and participated in it for years as a corporate soldier in charge of sales and marketing. Let’s shift our attention back to the joys of downsizing, tiny living, and small houses. The tiny lifestyle requires non-conforming, creative, and innovative thinking. One way to get your juices flowing is by looking at the ingenious things people have done with their small and tiny houses. The best way to do that is with pictures. This series of about six articles are packed with pictures that focus on various small and tiny house topics. I’ll be posting no more than one (1) article during any particular day. And I may or may not post them consecutively. I hope you get some ideas and inspiration from these photo tours. Update: Since the series has concluded, here is a list of all the articles.